My mom has always been supportive of me and everything that I’ve done. She’s known me to be a strong feminist who is unafraid to express my opinions openly. She’s been tremendously supportive of my feminist blog and curious as to whom my latest interview is about. My mom has always had an open mind and an acceptance of different perspectives, people, and worlds that are unfamiliar to her own. This is one of her strengths and one of the ways she’s been a feminist role model for me. Even if she didn’t agree with something that I was doing or engaging in, my mom was still supportive. Early on, my mom noticed that I was uncomfortable being a girl and that I didn’t want to be one. When I was a late teenager playing around with gender norms, she was afraid that I wanted to be a boy, and she was frank with me about not wanting a boy. But, she still bought me “men’s” boxer shorts that I was into wearing (to bed and underneath my jeans) along with my obsession with cologne. And, when I cut my hair “boy” short and began looking more androgynous, she continued to give me compliments on my appearance. She was uncomfortable with the idea of me, possibly, wanting to be a boy, but at the end of the day, I was her child, and I was the most beautiful, precious thing in her heart. Not only has my mom been a feminist role model to me and an amazing parent, but she’s become my best friend. I remember when I used to avoid my mother’s phone calls, and, now, I cannot imagine a day without hearing her voice. My relationship with my mom has grown over the years. 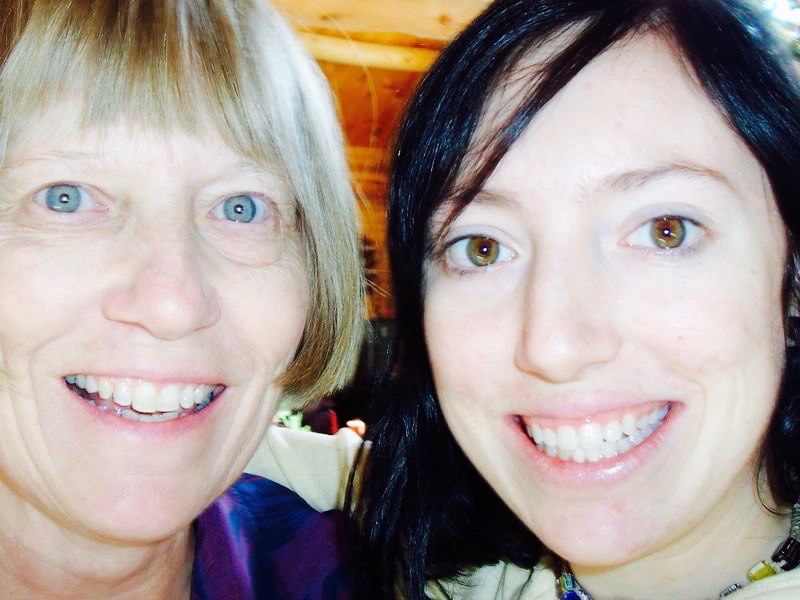 When I turned thirty, the reality of death became more apparent, and I went from being the moody daughter with an attitude to appreciating and savoring my parents as much as I possibly could. I found myself less annoyed with my parent’s habits, and less concerned with any political and religious differences we shared. As I became more accepting of who they were, I found a new level of gratitude and appreciation for them, and for the lives they have lived thus far. There’s a word that I learned in polyamorous communities called, compersion, which means to feel joy or happiness for someone else’s joy and happiness. I started to feel this way towards my parents. Before, I was more self-centered, expecting this and that from my parents, and having very little concern with who they were and what they were experiencing in their lives. Now, feeling compersive towards them is one of the greatest joys I have ever experienced. When my mom is excited and engaged in something that is making her happy, I am elated. As the years continue, I turn more and more into my mother, and I love it! There is the predominate fear in our society for women to become like their mothers because god forbid! I can understand why this may be true for many, but I hope we can eliminate that fear as the norm. No mother is perfect, but I know that there is, at least, one admirable quality that each mother possesses. I no longer fear being like my mother because I know that the more I become like her, the better person I will be. Every time I see a part of myself that reminds me of my mom, I smile because I am becoming more like one of my role models. One of the ways that I’ve turned into my mom is becoming a mom myself. I do not mean by having children. In fact, I do not want children, but I define motherhood like my friend, Talia does. In my interview with Talia, she speaks of how we are all mothers of something because we all birth something, whether it’s an idea or a baby. I feel like a mother to my mother. I want to care for her, nurture her, and protect her like she’s my baby. I’ve even started calling her “Bebe,” one of the many nicknames I’ve given her. Partly, because she cries a lot, in sadness and joy, and because I feel a love for her that I describe as motherly. She is my bebe and I want to give her everything! In celebration of Mother’s Day, I feature my mom to give honor, respect, and appreciation to her, her life, and to all that she’s given me. Because my mom birthed me, has been a role model, an amazing parent, and a dear friend, I want to feature her and elevate her voice. My mom has always told me that she would give me the whole world if she could. Mom, you’ve given me so much more through your growing acceptance, undying support, and unconditional love. I am forever grateful. Bebe, I love you! My mom was born in 1949 and grew up in rural Iowa. She’s mentioned to me that she had a hard childhood and overcame a lot, but she’ll never speak of the details. This is probably for the best since I would be filled with immense anger knowing exactly what kind of hurt she had to endure. During her childhood, mom turned to books as her escape, and became an avid, lifelong bookworm. It was her love of books that led her to become a librarian after college. She married my dad at 21 years old and had me when she was 35 years old. From reading about places in books, mom’s desire for travel began young, and she’s been able to fulfill that passion ever since college. She’s 67 years old, now, and fully retired. She spends her days taking Zumba classes, walking in the pool, doing crossword and jigsaw puzzles, watching her two favorite TV shows-Homicide Hunters and Miss Fischer-and reading books, books, books! My love of reading. We had reading groups when I was in second grade, and the teacher put me in the highest reading group. Reading took off for me then. I wasn't read to as a child. Usually, kids like or love reading before second grade because they are read to. If I had been read to, I probably would have been an earlier reader. In college, when I was looking through the catalog for courses and majors, I knew that English was a natural major for me, but, then, I saw that library science was offered. I thought, "Aha, what could I do with that major? Be a librarian!" Reading was my escape growing up in a dysfunctional world. It was my window into the world. You say reading was your window into the world. What did you learn? Travel. I learned about the tourist places, mostly in the United States, through novels. Also, reading about fictional characters that were of my own age, like Nancy Drew and The Bobbsey Twins, put into perspective lives that were different from mine. Did your reading of places lead to your big desire to travel? Yes. I wanted to see the places I read about because I enjoyed what I had read about them. I just thought, "Wow, some of this stuff is awesome!" What were some of the places you read about that you wanted to visit? Growing up in a Midwestern town, I wanted to see the cities, like New York City, San Francisco, and Los Angeles. These were the cities that were in books more often than other cities. Then, of course, I wanted to see the mountains and the ocean. What are some of your favorite places you've traveled? Switzerland because of the Alps, and its mixture of the rural settings and the cosmopolitan. I love San Francisco because it has the water, the Golden Gate Bridge, Muir Woods, and Chinatown; there's so much to see and do in that area. Also, Vienna because of the Danube with the boat rides, the Johann Strauss concert we attended, and the architecture. But, they didn’t move to Colorado right away. After college, they moved to Illinois, where my mom worked her first teaching job. After three years, mom and dad moved back to Iowa so that my dad could focus on training for the Olympics in wrestling. But, my parents never forgot their love of the mountains, and, eventually, moved out to Colorado. In Colorado, my mom continued her career as a librarian and a teacher. "Books are meant to be shared, not hoarded. That's why I like libraries so much." I loved learning and reading, and wanted to instill that in others. It was rewarding because I could have kids read books that they would enjoy. I could get them interested in different genres of literature. What is your favorite genre of literature to read and why? Mystery and fiction. I like mystery because I like puzzles, and mysteries are like puzzles. I like to figure it out. I'm always curious, who did it? Most of the time I'm right. The ones I read aren’t predictable at first, but I can figure out who did it after 100 pages. The Velveteen Rabbit because the theme is unconditional love and acceptance. Also, Catcher and the Rye because the character was wild and unconventional. I was a 9th grader in high school when I first read it, and we weren't supposed to read it. I loved that it went against the grain because it was something that I would never do. I was like, "Oh my god, he didn't obey the rules!" I was fascinated by that. It was something new and different. As an avid book reader and librarian, one would think that my mom would have a library of her own at home full of her favorites and the ones that influenced and moved her. But, she’s had no such thing. Growing up, we had one bookcase in the house, but only two shelves of it were filled with books and they weren’t favorites or classics or anything memorable. The other shelves were filled with file folders and random stuff. Why don't you keep your books? Books are meant to be shared, not hoarded. That's why I like libraries so much. Do you believe libraries are going extinct? What do you want to see change with libraries? There's always going to be libraries, technology or not. We need book mobiles to get to the rural areas. It's the people in the rural areas that are denied access. What do you think of kindles? Do you think people should go back to reading books instead? Whatever gets somebody to read, so, no, I don't have an opinion on kindles. My mom is one of the biggest introverts I know. When both of my parents started spending their days at home, my mom told my dad that he had his TV in the living room and she had her TV in the lanai. Mom has always needed her space from people. Mostly, that space is dedicated to murderous stories and mysterious characters from her books. She has her friends that she enjoys lunch or a hot tub visit with, but she doesn't like to socialize too often. Maybe it’s because, as she mentioned to me, she didn’t have playmates as a child. She’s described herself as not having been a child child; she was mature for her age. She had to be because, as she’s told me, she didn’t have any role models. Perhaps this gave her a greater independence as well. Though my mom married at 21 years old, she’s one of the most independent persons I know. She’s happy to be alone and do things alone, like eating at a restaurant by herself. It’s something she doesn’t do often, but is happy to when she craves Chinese food since my dad doesn't enjoy it. But, when I think of what truly makes my mom independent, it’s that she doesn’t need my dad like he needs her. She doesn’t need other people to engage in something that she wants to do. She’s my first role model to show being comfortable being alone with herself and enjoying her own company. It’s probably why I grew up fiercely independent. Independent women have always inspired me, and my mom was the first. Another thing I’ve admired about my mom was how long she waited to have a child. While my parents married at twenty-one, they didn’t have me until they were 35 years old. In the 70s and 80s, having been married for fourteen years without a child was probably pretty rare unless a couple wasn’t physically able to reproduce. You got married when you were 21 years old, but you didn't have your first (and only) child until you were 35 years old. That must have been rare in those days. Tell me more about this. I wanted to work. I worked as a teacher during the school year, but while other teachers took summers off, I worked other jobs. I worked summers in factories-one where I sawed lumber for wood cabinets, one was at a turkey factory, and one I was putting together parts for airplanes, which was the most boring job I’ve ever had. I was never a child's child. I was mature for my age. And I wasn't involved with children and didn't live in a neighborhood where there were many children. I didn't have playmates. I wanted to wait to have children because there was so much I wanted to do first, like travel and work; I had a good work ethic (one thing I grew up with). I wanted to wait to be a good parent. I wanted to be ready, to be really ready. I was, somewhat, afraid to be a parent because I didn't have any role modeling. I had no idea how to be a parent. That's where books saved me, again. Books or no books, my mom was a natural when it came to parenting. It brought out all of her deeply nurturing, caring, and loving parts. Honestly, I don’t believe my mom ever really wanted a child because of the reasons mentioned above. But, when she found herself pregnant in her mid-thirties, she embraced me with loving arms. She’ll tell you, today, that being a mother is the greatest gift she’s been given. Mom discovered she was pregnant with me during her second summer in grad school. She stayed in the dorm during the week, and would drive four hours back home on the weekends to be with my dad, another example of her independence. When did you go to grad school? Tell me more about that experience. I was 34 when I went to grad school. I only went for two summers, that's all. I graduated from Greeley in Educational Media and Technology. My master's thesis was on bibliotherapy, which is reading books for therapeutic reasons. I stayed in the dorm on campus, but came home on the weekends, which was a four-hour drive one way. I liked grad school. I was pregnant with you during my second summer in school, but didn't have any physical issues. I got a lot of sleep, took a lot of walks, and ate a lot of vegetables and fruit. Lastly, I am reminded of sociology class junior year of high school when we were asked to write an essay about our hero, and I wrote about my mom. Mom, you’re my shero, my best friend, and my bebe. I love you forever and ever, and I want to spend an eternity with you! Places that are on your bucket list? Alaska to see the nature. I've been to every state in the U.S. except Alaska. Ireland because I'm Irish, and because the pictures I see of its ocean cliffs, green hills, and old castles look beautiful. What's been the most rewarding thing as a parent? Seeing my daughter's success, her independence, determination, and motivation. And that my daughter has become my friend, not just my daughter. I can cry with her. Is there anything you wish you had done differently in your life? I don't know how I could have prevented this but I was very shy as a child. I was so shy that in study hall, I wouldn’t get up out of my seat to get a magazine because I was afraid people would look at me. I wish I hadn't been so shy and that I was more assertive. Also, I didn't have much opportunity to participate in sports. I think that would have been fun. What did you appreciate about your mother? She always supported me with everything. She was a good grandmother. She had a sense of humor. I appreciated that she took care of herself and her health. What would you say to your mom now? I love her. (*mom starts crying*) And I miss her. If you hadn't been a librarian/teacher, what would you have done? A counselor. I like to help people and I'm a good listener. Also, detective work but without seeing dead bodies! What's the best part about life? Living it. Seizing the day. Seizing the moment. Getting out of bed with gratitude. For my kindness and sense of humor. That I made people laugh and feel special. I forgot to mention that my mom is the funniest person I know. She will, without a doubt, be remembered for making me laugh. And, when I can make her laugh (which I, thankfully, tend to do often), then my day is made. Our shared laughter and inside jokes are my favorite things that I treasure immensely.